Will, Shawn and I caught Shuksan almost to ourselves in great weather last weekend. Drove to within about 1.5 miles of the trailhead, though the thin cover will melt soon. Remainder of road was patchy to TH, then trail was continuous for a bit, then bare for a while, then patchy, and finally continuous starting about 30 minutes before the first big hairpin that leads up to Shannon ridge. No problems getting up to the ridge or over to the notch that leads to the Sulphide, though the snow was starting to bake and we were a little worried crossing the bowl. After the notch we encountered a big debris field of car sized blocks that had melted off the rocks on towers above. There looked to be a bit more left yet to fall.� Camped around 6500 feet in a flat area of the glacier, with healthy winds despite the earlier calm day. Wind kept up through the night, nicely blowing snow into the tent from underneath the fly. We carried glacier gear for the climb up toward the summit pyramid, but didn't use it. The glacier is super well filled in, we never had to come close to any crevasses or sags. Upper basin between the sulphide ascent and the pyramid is completely filled in, not sure if that's typical. After debating for a while we decided to give the summit block a go up the main gulley, kicking steps in the warming snow. The snow got progressively more rotten higher up (gets less shadow so sun first?) and we couldn't tell what was cornice vs supported, so after we poked our heads over the top we decided not to mess with the giant rime bulges and just get back down. Carried skis up but didn't feel confident enough about things to ski out, so downclimbing it was. I got pretty worked on the way down. 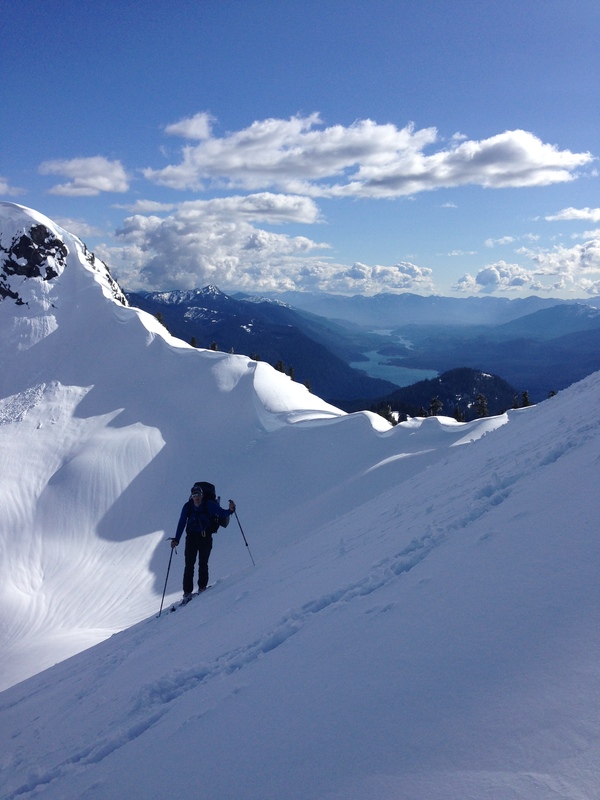 Once off the block we had great corn down to camp, then manky but skiable snow back down to below shannon ridge. Overall a great weekend in the alpine. We only saw one other party (came up sulphide after us), and saw no tracks or bootpack on any of the upper mountain. Pretty spectacular views to boot. Mt. Shuksan was one of my first routes in the Cascades with my wife (then girl friend). That was before I saw the light and started to ski. We went in summer and got off route (to the climbers right). We met a couple of Canadians who were climbing the fifth class blocks in big boots and moving fast although they were belaying. They directed us to the standard gully route and after traversing and climbing the gully, we met them at the summit. We felt a little weird about crowding on the summit with them since no one else was around and they got there first and by a harder route. Their response was "no worries" and offered to share some of their bagel sandwiches with us. Both Shuksan and Canadian climbers have a warm spot in my heart since that day. Thanks for bringing back the good memories.